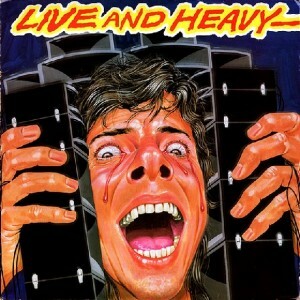 This seems to be one of those live albums that everyone likes to point to as a live-album-gone-wrong. Not really sure why. I can understand some of the bitching about the track listing but Ritchie has always done whatever he’s wanted to — fans be damned. So I’m sure he had his reasons for not including “Stargazer”, probably just to tick people off. Whatever the case was, with only the debut and Rising under their belt, I think the collection of songs here is just fine. Especially when you factor in the band debuts “Kill The King” from the forthcoming Long Live Rock ‘n’ Roll album, plays Deep Purple’s “Mistreated” and basically plays an extended version of the songs. I’ve even read some state this album is boring, that is lacks energy. I just don’t see it that way. I’m one of those guys that LOVES going to a concert and watching guitar solos and drum solos and all of that stuff. I don’t see how anyone who truly appreciates rock music or music in general can say stuff like that is boring. Just listen to Blackmore and keyboardist Tony Carey as they duel together in the middle of the medley. Listen to that bit of blues played in that medley as well. That’s great and classic stuff. I love it whenever a band stretches out a song in concert and segues in and out of different songs and solos. The crowd obviously was having a blast because they started clapping to a beat while Ritchie fiddles around in the middle of “Mistreated”. This is one of the grandest and most epic live albums I have ever heard and not for one second was I bored with it. It’s like actually being there in concert. This is what you would have heard. Extended versions like these are where you really get to see a band act like a band and play off each other. It’s amazing. This a true classic featuring Ronnie James Dio and Ritchie Blackmore — two of the most legendary figures in the world of rock and metal. 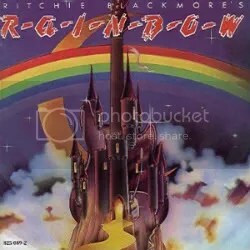 Essential listening as far as I’m concerned because the Dio era of Rainbow can really do no wrong. I’m so sorry I ever took so long to get into Rainbow. I really like all eras of the band but obviously the Dio years were the best and the debut is also the best of the band’s catalog. I can’t stop listening to this CD, there is NO filler here at all. The only song that comes close to being filler is the cover of Quatermass’ “Black Sheep of the Family”, which is funny because that song is the one reason Rainbow existed — Deep Purple refused to cover it at Ritchie Blackmore’s request so he went out on his own to do it and the recording session morphed into a full album and a new group (Blackmore + Elf = Purple Elf?). Yes, there are a number of epic songs from the next two studio albums but this whole album just really pulls me in. The album has such a classic rock ‘n’ roll sound coupled with some really cool melancholy tunes (“Catch the Rainbow”, “The Temple of the King”) and a bit of a loose, bluesy feel at times (“Snake Charmer”, “If You Don’t Like Rock ‘n’ Roll”) all while playing into Blackmore & Dio’s sword & sorcery obsessions and setting the blueprint for the next generation of rock bands. “Man on the Silver Mountain” and the cover of The Yardbirds’ “Still I’m Sad” are the hardest rocking songs of the bunch but the previously mentioned melancholy laid back tunes really get to me and have gotten the most play from me thus far. The album really is almost perfect, such a great balance between ballads, “heavy rock” and good ol’ rock ‘n’ roll swagger. Really what else can be said that hasn’t been said since 1975? Easily one of the best rock albums of all-time! Everyone should own this! Don’t get me wrong, I like Dio-era Rainbow, but it’s their more AOR/commercial-minded efforts that I enjoy most. I’ll put the slick mainstream hard rock of “Since You Been Gone”, “Street of Dreams” and “Stone Cold” against anything they did when Ronnie James Dio was in the band. And Dio wasn’t the only Rainbow member to exit the band: Bob Daisley and David Stone were replaced by former Deep Purple bandmate Roger Glover and keyboardist Don Airey. With journeyman Cozy Powell on the drums, this is an incredibly strong line-up. 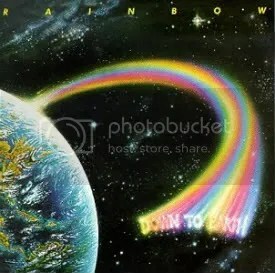 It’s a shame things didn’t work out with Graham Bonnet (this is his only Rainbow album) because he’s a fantastic vocalist turning in some great performances on “Makin’ Love”, “Eyes of the World” and “No Time to Lose” especially. The sound is different from the medieval so-called “dragon rock” of the Dio years, but as far as I’m concerned this is another classic release and is fantastic from start to finish it… even if my woman said she didn’t like it and “they should like they’re trying to be KISS”.